Hello all. 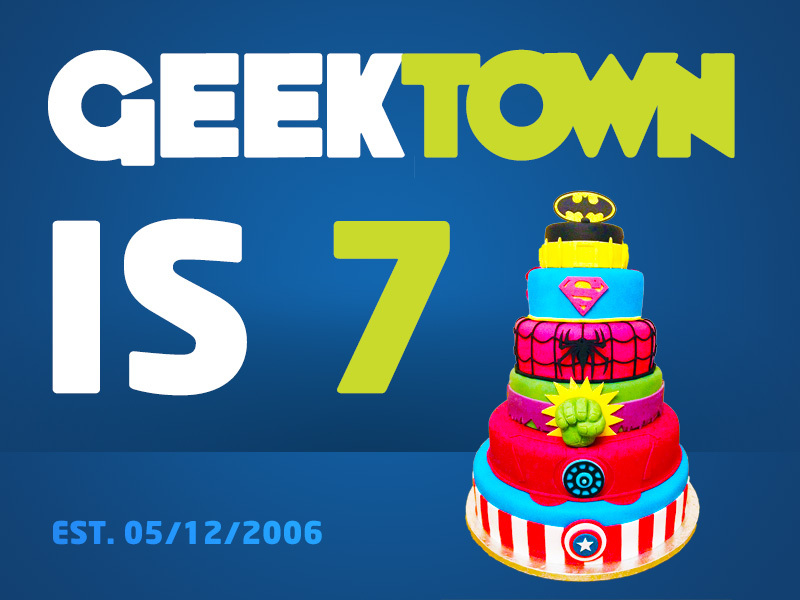 Just wanted to pop up a little post to say Geektown hit it’s 7th Birthday today, and to give a massive THANK YOU, to all the people out there that have helped contribute to the site over the years. What started out as a little hobby site for myself and a few friend to post random stuff that entertained us, has grown exponentially over the past few years, and we couldn’t have done it without the wonderful community of regular visitors that comment on posts, and help with info on the massively popular tv air dates section of the site. I’d also like to say a huge thank you to Andrew (our TV Editor), and Scar (our Film Reviewer), for the amazing work they’ve done this year, along with the many other guest writers that have written for the site over the past 12 months. I should also pass on a thank you to Jo, Craig and the other guys at Kualo Web Hosting, who’ve been amazing in helping deal with the increased traffic. I rely on Geektown for all info on weird and wonderful Sky updates. However i now find that every time I access the website via my android mobile I get blocked by a huge orange popup which I think is for s gambling site. Had anyone else reported this problem and is there a solution ?